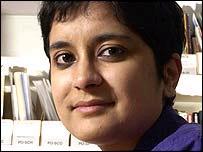 Following the Question Time debate on 18 January, Shami Chakrabarti, the Director of Liberty answered a selection of your questions. A: No far from it and I think that my feelings were pretty clear to Edwina and everyone else in the room. I don't see how it is at all helpful or right to replace one abuse with another or as people said to me in the street the next morning, to "go down to that level". It wasn't just Edwina's remark that shocked me but the applause that followed from some of an otherwise highly sensitive and sensible (it seemed to me), studio audience. Perhaps it demonstrates that it isn't just Big Brother contestants, but all of us who too easily follow the pack during moments of heightened emotion. I think that there is a lot of rubbish talked about human rights in this country. Some people think that it's all about running to court all the time or about protecting criminals instead of victims etc. In my view, human rights are summed up by three words - dignity, equality and fairness. These are values that govern civilised people and societies and the way that they treat individual human beings. These principles were not in evidence in the Big Brother house during the whole racism and bullying row but I hope that they will be reflected on by anyone tempted to think that Ms Goody and her friends are now somehow "fair game" because of their past bad behaviour. To be fair to Edwina - she told me afterwards that the words "just came out" and I feel sure that no concerned grandmother would plan to say such a thing on national television. A: I can't claim to be an expert on international affairs but I don't think it can be generally feasible to think about "one thing at a time" in this context. It's clearly right that we should all be worried about Iran's plans. The more difficult question is how best to address them. A: Back to Big Brother then? I think that one of the reasons why everyone scrapes around for words other than "racist" is because in our relatively enlightened society, this label is quite rightly a very serious one. However racism is actually simply racial prejudice or somehow judging people on the basis of race, whether or not the prejudice is ever articulated or acted upon, let alone by way of overt discrimination or abuse. Prejudice in all its forms probably comes from a combination of ignorance and fear and in honesty, most of us have the capacity to fear things or people who are unfamiliar or different. Sometimes (as in the case of the Big Brother debacle), we see a little of our own experience (past or present) in the behaviour of others and fear branding it "racist" for that reason. So yes, I do think that in these circumstances people use phrases such as "ignorance" and "lack of cultural awareness" as slightly gentler, less damning terms for describing racial prejudice. A: There has been an authoritarian trend in British politics that began before this government. I think it begins when people play too much politics with home affairs, with law and order, with anti-terror policy, with asylum¿ You very quickly get into an arms race of the toughest rhetoric, which can often only really be substantiated by equally tough legislation. It's an arms race that doesn't make us safer in substance. It doesn't actually solve crime or terrorism because it doesn't deal with complex root causes. But it does leave us with a constitutional poverty, the statute book having been covered with all of these very sweeping laws that eat away into our rights and freedoms. A: There is no such thing as a community or nation that isn't made up of individual human beings who I say, should be equal in their dignity and worth. The rights of individuals must of course be firmly placed within the context of their role as a member of the community and society at large. The whole of our social existence is a series of relationships, at home, with our friends, neighbours, associates and others. Some are of our choosing and others not. To a greater or lesser extent, modern civilisations regulate these relationships with legal ties and obligations that for the most part seem almost invisible to the naked eye. In recognition of an individual's role in society, the human rights framework was deliberately designed so that the rights of an individual are not absolute but can be balanced against the greater public good. The only real exception to this is the prohibition against torture. Torture will never benefit society as a whole. Instead it demeans each of us and our abhorrence of torture firmly separates democratic societies from dictators and terrorists. A: Faith like science has always been part of the human experience. It seems to me that broadly speaking, there are three possible approaches to the relationship between religion and society. Firstly, you can have a theocratic society where the rules and rituals of one dominant faith provide the ethical and legal underpinning for every institution of the state. At its worst this model produces Afghanistan under the Taleban but no doubt there are more benign examples. Conversely, you can have an aggressively secular state where the expression of any religious faith is either driven into the private realm or made the basis of even greater persecution. You see the worst examples of this in the great totalitarian regimes of the last century but gentler versions exist even in parts of the democratic world today. Finally, there is the idea of a democratic society bound together by certain core values that can and should be shared by people of all faiths and none. This society respects difference; respects freedom of conscience, thought and religion and free speech within such proportionate limits as are necessary to protect others. Such a society need not merely tolerate people's religious or indeed political differences, but can positively respect them within the limits of e.g. such laws as are necessary to protect people from discrimination or abuse. This is the long path that I believe our country has been on since perhaps the time of Elizabeth I. Religion like any other belief system, is of course capable of being the excuse for a great deal of bigotry and barbarism. However we must not forget that is also capable of being the inspiration for great art and altruism. Many religious people that I have met are instinctively sympathetic to the idea of human rights because they share the belief in the inherent dignity of every individual human being. To be more specific for a moment, I was delighted when British Airways changed its uniform policy so as not to discriminate against devout Christians and disappointed when some Church leaders sought exemption from laws designed to prevent discrimination against gay people.